Note: Kettlebell weight is up to 35lb. for men and 25lb. for women. You must use the same weight Kettlebell on the Sumo Deadlift as the Thruster. Advanced Athletes may do 30 Double Unders instead of the 60 Weighted Jumps. 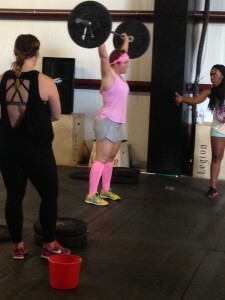 On the Thruster, alternate hands as necessary, or complete all 30 repetitions with one hand. Join us tonight from 6:00 to 7:00 PM for the CrossFit Amundson Yoga and Mobility Class at our Krav Maga studio.